Unleash incredible magical powers as you tear your way through a medieval castle in search of lost plunder. Step into the shoes of a prodigal mage and, using the power of PS VR, tear your way through a vast castle in search of gold, treasure and a hidden family fortune. As a young mage recently returned from magic school, unleash your newfound powers on the former family home as you seek to oust a sneaky spiritual creditor who has cheated your family of their wealth. 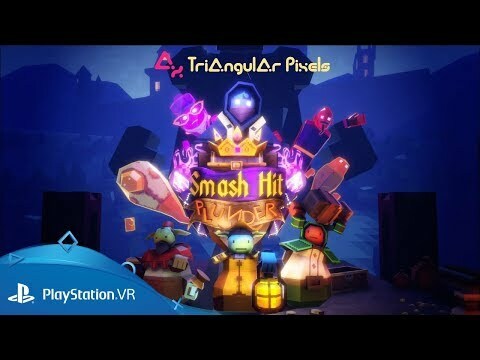 Built for PlayStation VR, Smash Hit Plunder combines the immersive experience of the PS VR headset with the PS4’s unique Social Screen function, allowing for a mixed multiplayer experience as your friends play along on the TV while you explore from inside the headset. Wield your all-powerful wands as though you were standing right there, taking a PlayStation Move controller in each hand and cast spells with reckless abandon. PlayStation Move tracks your exact movements in real-time creating the ultimate sense of in-game immersion. Race against the clock in Treasure Hunt and gather as much as you can within the time limit. Hunt for a specific piece of loot in 'Scavenger Hunt'. Explore at your own pace in 'Free Play' and make your way around the castle in your own time. Team up with your friends and work together in either 'Treasure Hunt', 'Scavenger Hunt' or 'Free Play' modes. Go head-to-head with up to three friends in either 'Poltergeist Panic' or 'Jewel Duel' modes and fight for a place on the dynamic leaderboards.